Samantha & Joaquin wanted a day that celebrated both them and their love for one another. No frills or fancy things. They were married in a beautiful and relaxed beach setting surrounded by family & friends. “It all started when my boyfriend proposed beneath a waterfall in Costa Rica and became my fiancé. It was easy to get caught up in the dates, the venues, the décor, the dresses. About a month in we scrapped it all and took a step back. It was important that our day remain true to us. Our planning was a bit backwards and unorthodox but it worked for us. That night we decided we wanted to keep our day intimate and simple and knew we wanted it to be in one of our favorite destinations. So, like anyone would do…we jotted down our top three destinations we had travelled to together, threw them in a hat, and picked one: Tulum.” Samantha told us. “We had been to Tulum a number of times together so we already had a good feel for the food, accommodations, and vibe. We are both foodies and had fallen in love with Posada Margherita on our previous trips—that became our reception location. We also loved that sliver of the beach—so Cocina de Corina (next door) became our ceremony location. We knew we wanted to stay true to Mexico and the locale—so we called on Cherry Blossom to create floral arrangements that were made up of local ferns and white blooms. Needing someone to tie all the pieces together—Cherry Blossom pointed us in the direction of Arlenis Ruiz and it was a match made in heaven. Arlenis referred us to Sarah Garnier, Enrique Monroy, and Quetzal Photo—each of whom were the perfect fit, it’s like Arlenis knew us before even meeting us. 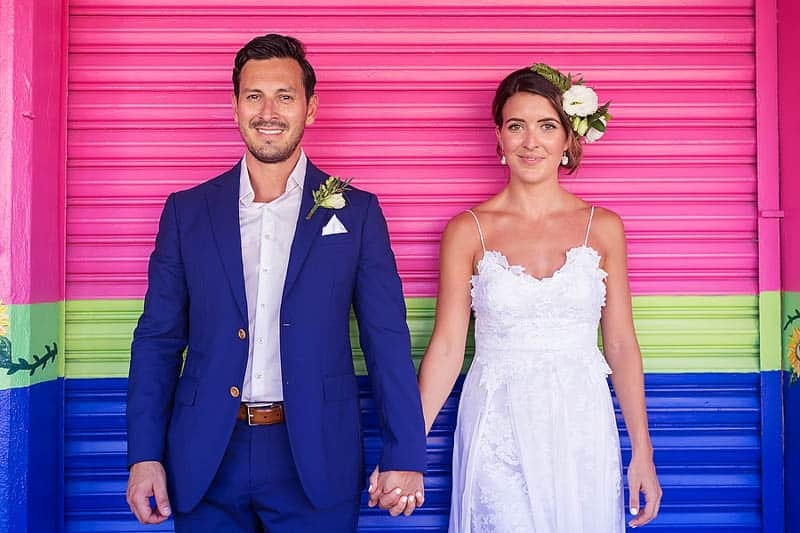 Sarah made me feel beautiful on our day, Enrique offered the most ideal blend of humor and guidance in our ceremony, and Quetzal Photo captured each moment in such a true, colorful, and beautiful way.” She continued. What a lovely wedding at beach, so adorable and a fantastic idea too. Its so bright and colorful. Keep posting these lovely wedding posts..